Flight Lieutenant Lloyd Samuel Breadner (Royal Naval Air Service) drives down a hostile machine which is wrecked while attempting to land in a ploughed field. Boatswain Edward Clark age 34 the brother in law of the ship’s master and one of three brothers who will lose their lives in the merchant service in the Great War. Captain John Edward Day (Irish Regiment) is killed at age 22. His brother was killed in November 1914 and they are sons of the Very Reverend Maurice W Day Dean of Waterford. Captain Victor John Whitaker (Lincolnshire Regiment attached Royal Flying Corps) is killed at age 19. His brother was killed in August 1915. Lieutenant Albert Villiers Zacharias-Jessel (Durham Light Infantry) is killed in action at age 21. He is the son of the late Councilor Zacharias-Jessel. 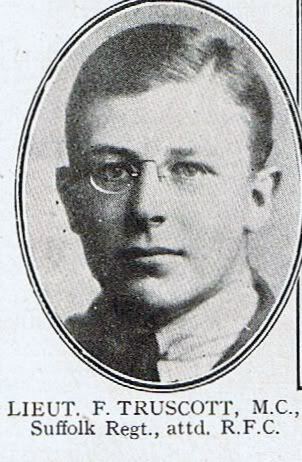 Lieutenant Francis George Truscott MC (Suffolk Regiment attached Royal Flying Corps) is killed at age 22. He is the son of ‘Sir’ George Wyatt the 1st Baronet and Lord Mayor of London 1908 to 9 and grandson of ‘Sir’ Francis Wyatt Truscott Lord Mayor 1879 to 80. Private John G Miller (Highland Light Infantry) is killed in action. His brother was killed on Gallipoli in August 1915. Private Thomas Gray (Seaforth Highlanders) is killed at age 19. His brother was killed in October 1916. Private Alan Maynard Pennycuick (Australian Infantry) is killed at age 26. His brother will be killed next October. Private Eric Gordon Barnard (Australian Infantry) is killed at age 24. His brother will be killed in January 1918.